EUGÈNIA BALCELLS is a pioneer of Spanish experimental cinema and audiovisual art. She began working as an artist in the mid 1970s after gaining a degree in technical architecture at the University of Barcelona in 1967 and an MA in Art at the University of Iowa in 1971. Among her early works the film FUGA (1979), the video INDIAN CIRCLE (1982) and the installation FROM THE CENTER (1983) stand out. Books (MÖEBIUS SPACES, OPHELIA…), scores (FLIGHT, XEROX MUSIC…) and projects on issues of our times (PORTABLE ALBUM, BRINDIS, ON AND ON…) complement her large installations. These include: IN TRANSIT (1993), IN THE HEART OF THINGS (1998), A SPACE OF ONE’S OWN (2000), RODA DO TEMPO (2001). 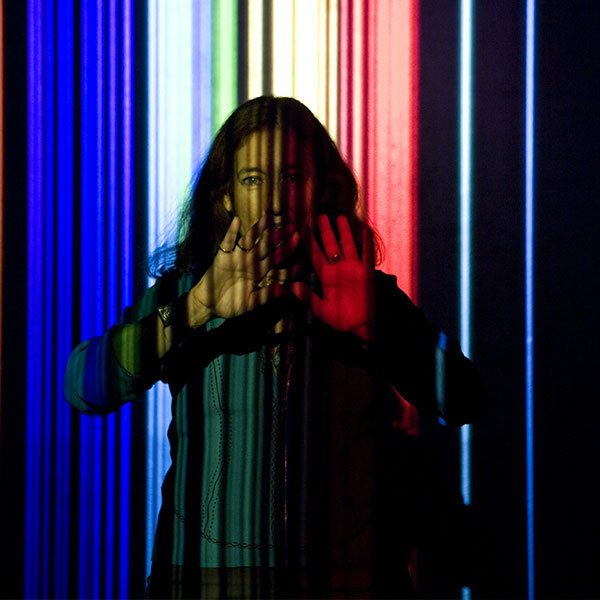 Her investigations into the possibilities of the electronic image are a constant feature of her work, as in: COLOR FIELDS (1984), TV WEAVE (1985), TRANSCENDING LIMITS (1996), FREQUENCIES (2009), COLOR WHEEL (2009). In 2012 her exhibition LIGHT YEARS was presented at Tabacalera in Madrid. This exhibition is composed by two installations: UNIVERS and FREQUENCIES, a mural: HOMAGE TO THE ELEMENTS and a film GLIMPSE OF THE UNIVERSE. This exhibition started the international itinerancy in Mexico in 2015, in the Centro Nacional de las Artes, in DF, and in Queretaro. In 2017 was presented in Panamá and in 2018 in Barcelona’s Science Museum, CosmoCaixa. Ministry of Culture in recognition of her artistic career.